Are you trying to decide between Wix vs WordPress to build your website? While WordPress is the most popular website builder in the world, it is not the only option. 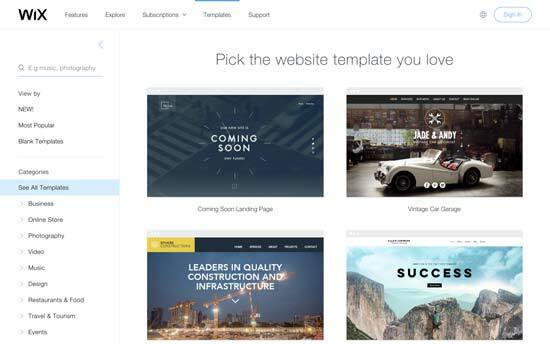 Wix is another popular builder that allows you to easily create a website. 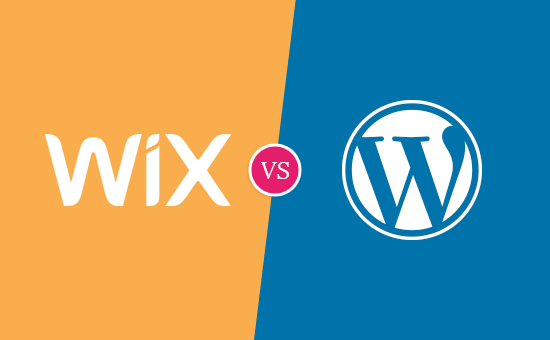 In this article, we will compare Wix vs WordPress and highlight the pros and cons. Our hope is that with this Wix review and comparison, you will be able to decide which platform is right for you. The cost of building a website is an important factor when choosing your platform. The total costs of developing and maintaining your site will entirely depend on your needs. Our goal is to make sure that you can do whatever you need within your budget. Apart from that, the basic plan does not offer necessary add-ons such as Google Analytics, Favicons, eCommerce, etc. To remove ads and get additional features, you’ll have to upgrade to one of the premium plans they offer. This cost does not include any apps that you later choose to use on your website. The WordPress software is available for free for anyone to use. We often get asked about why is WordPress free and what’s the catch? Well, the biggest catch is that you need your own domain name and web hosting to install it. There are several WordPress hosting providers that you can choose from. See our guide on how to choose the best WordPress hosting. 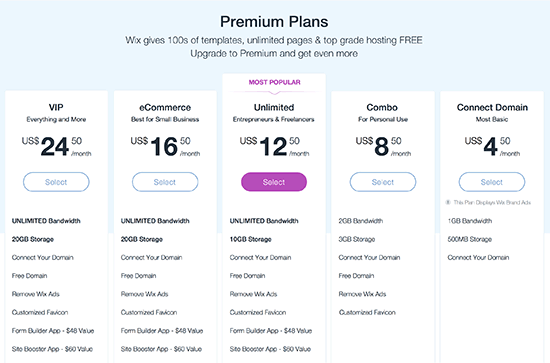 Depending on your budget, you can start with a basic plan with a WordPress hosting provider like Bluehost that will cost you $2.75 per month and includes a free custom domain name. If your budget permits, then you can use a managed WordPress hosting provider like WPEngine which costs $29 per month. The cost of a WordPress site will increase if you decide to use premium WordPress themes or plugins. However, there are thousands of free WordPress themes and plugins available that you can use to reduce costs. You can add any feature to your WordPress site using a plugin without upgrading your hosting plan. Most beginners don’t want to spend too much time learning new skills. 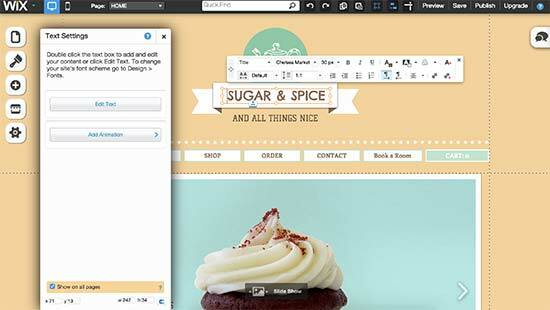 Both Wix and WordPress allow you to create websites without learning to code. 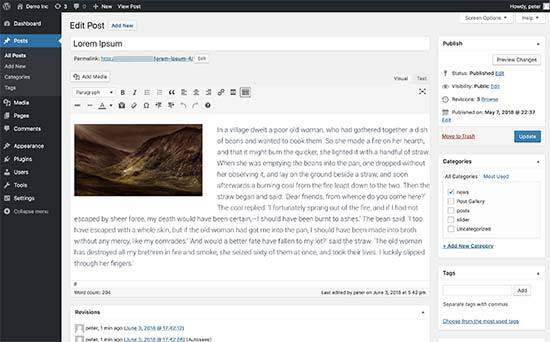 WordPress comes with a visual editor to write your content and theme customizer which allows you to edit your theme properties in a WYSIWYG environment. However, by default WordPress does not come with a built-in drag and drop page builder. 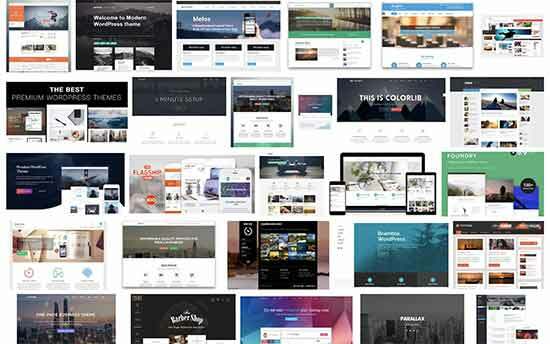 However you can use powerful WordPress page builders like BeaverBuilder or Divi that offers a lot more power than standalone Wix builder. WordPress themes range from small personal sites to full-fledged eCommerce sites. Most themes come with built-in customization options of their own. You are also free to further customize them using your own child themes and plugins. 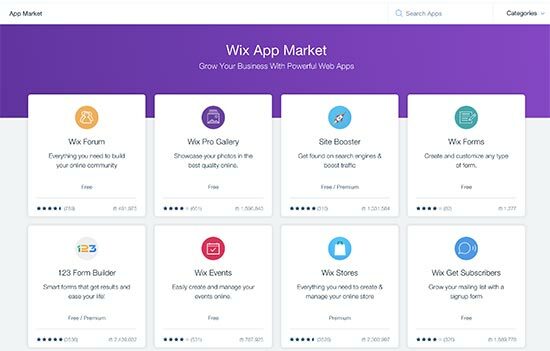 Wix comes with nearly 200+ apps that you can add to your site. These apps offer a wide range of features like adding contact forms, gallery, comments, email list and so on. The saying goes: if you can think of it, there’s probably a WordPress plugin that makes it happen. There are a few third-party apps that you can use for selling things online, but those apps would cost you even more money with their monthly fees. Not to mention you have limited payment gateways and limited functionality. WordPress makes it super easy to create your online store using WooCommerce, which powers more than 42% of all ecommerce websites in the world. There are also plenty of other eCommerce plugins available for WordPress that you can use to sell physical or digital goods, services, events, subscriptions, and more. Most eCommerce plugins for WordPress even have their own dedicated themes and have plenty of themes designed specifically to work with those plugins. See our list of best WooCommerce themes for some excellent examples. If you want to build a proper online store and be ready for growth, then WordPress offers much more flexibility, freedom, and choices when compared to Wix. WordPress is far superior to Wix as a web publishing platform for any kind of website. While Wix offers an easy to use website builder, you can accomplish a lot more with WordPress over the long run. See our guide on how to make a website using WordPress for step by step instructions.